Well the days are marching by pretty fast for me and even with this wet and cold weather (which I am sick of - roll on summer) I have made a start to get the summer stock all done so that it is ready to come out for the Pirongia Craft Market at the end of September, and I aim to get it onto the website as it get finished this year, there are some lovely new 100% cotton fabrics coming through and this is hard to concentrate on when all I want to do is sit by the heater and watch the Olympics, and boy there have been some very exciting times so far watching us get two Bronzes and then last night the awesome gold medal. We have changed the length of the our Cotton/Merino Sleeping Bags to make them longer and also to have only two sizes in future, this way you will get longer use out of your bag, so if you go to the Current Specials page you will see all the old sizing ones there on special. 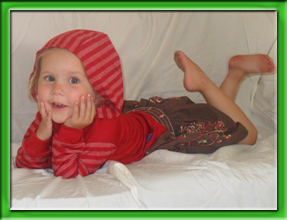 This Ruby and she is wearing our Critters and Butterflies Bag, so you can click onto her photo and it will take you to all the Specials of the Sleeping Bags. Our Fairy Dresses and Mermaid Tails are all cut out and ready to go now and I will have one very happy granddaughter who has been waiting ages for her mermaid tail like all the others. When we were at the Bumps, Bubs & Beyond Parenting Expo at the beginning of July we were interviewed by TV Central and we had some of our models there plus the TV Company used some of the photos of other children off our website so I have attached a link to the programme here for you to see it - 3minute tv show It was great to meet so many new people at the show and awesome to know that it is going to be a regular event every year and we have already booked our site for next June. Have you been to Chipmunks Hamilton yet, they have two awesome rides plus all the slides etc. This is definitely worth a visit and all my grandchildren just love it. Great for a rainy cold days as the building is heated and they have yummy food and coffee. If you have not already gone and liked us on facebook please follow this link and like us then you will be able to enter any of the competitions/specials etc that we run there and we are also trying to reach 1000 likers and when we do we will give a gift voucher to the lucky person who is our 1000 liker, Many thanks to all of you who have already gone and liked our page. 26th August to 28th August, Spring Gift Fair at ASB Stadium.